You might have followed the journey of ThingsCon over the past five years: from a two-day conference on hardware entrepreneurship in 2014, to a series of community-driven events all over the globe, from a small group of friends in Berlin to a broad and global community of peers that work toward ethical and connected technologies. This year we would like to take this a step further. We believe this is a special point in time, where we have the chance to peek at the future impact not only of connected technologies – but also of platforms, business models, and urban spaces, and help shape it for the better. We believe there are is a new economic model that contemporary technologies makes possible. And we feel it’s essential to take a stand on where we would like to see things evolving. On May 24, we’re hosting a small, intimate, invitation-only forum of peers, thought leaders, innovators, and researchers from the ThingsCon community and beyond. Think an unconference-style one-day event with a few high-level lightning talks, inspiring workshops and prototyping sessions – and lots of time to dive deep. A day by peers, of peers, for peers. Specifically, we’re interested in comparing notes about some of the opportunities and tensions that exist when developing new types of economic models in the IoT – as well as hands-on discussions around specific projects and ideas in cities and homes, in Europe and the US and in emerging markets. Since this is a trusted community event our space is quite limited. Our focus is on bringing people together with interesting takes on this topic to develop their own network, perspectives, and projects. That being said, we would warmly welcome application to join in! We set up a little form that you are welcome to fill out.Alternatively, fell free to shoot us an email and share why you’d like to be part of this. We would love to hear from you! 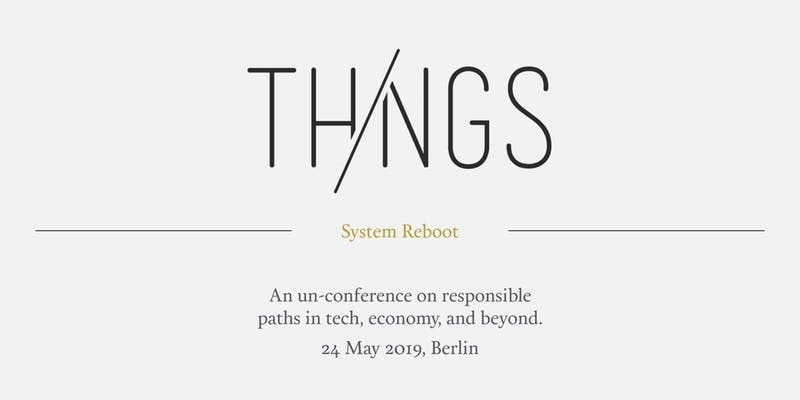 ThingsCon Unconf19 is taking place May 24 in Berlin. A fee of 50 EUR (net plus VAT) helps us cover food, venue, coffee – everything else is a community effort.